This is a melee ESO Nightblade build from Xinthisis Gaming. She deals great magic damage in the battle. The magic Nightblade is equipped with five Warlock Sets, two Malubeths Scourger sets and five Magnus Gift sets (including the weapon Restoration Staff). 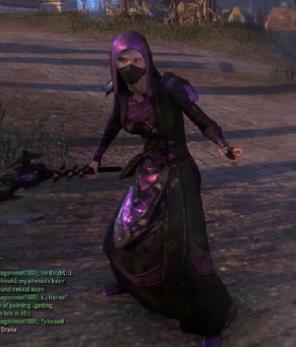 The Warlock Sets (Five Items): Magicka Flood once per minute, when below 33% magicka, gain 731 Magicka. The Malubeths Scourger Sets (Two Items): 6% chance on hit to proc 700 healing plus increase to all healing perfect for Nightblade. The Magnus Gift Sets (five Items): 8% chance to negate the cost of a spell. 1. Ambush. Players moves through the shadows, appearing next to target. Deals 406 Magic Damage to enemy and stuns monsters for 1.5 seconds or immobilizes players for one sec. Next attack on target deals 36% additional damage. 2. Surprise Attack. It deals magic damage to enemy If stealthed or invisible, attack sets target off balance ans stuns them for 4.5 sec.And it can reduces target’s 40% armor for 17.2 sec. 3. Aspect of Terror. It is a instant AOE to induce fear in nearby enemies for 4.5 sec. 4. Impale. It deal additional 300% of damage to the enemy with low Health. 5. Dark Cloak. It gives players invisibility for near 3 seconds and removes damage over time effect. 1.Piercing Mark. This skill can marks a target for dealth. Player’s attacks ignore 75% of target’s armor and spell resistance.Killing a marked target restores player’s Health by 40%. 2.Crippling Grasp. It siphons movement speed from target and gives it to player while dealing magic damage over eight sec. 3. Rapid Regeneration. It can heals two nearby wounded allies for over 1000 over 16.5 sec. 4. Healing Ward. It is healing AOE to heal allies for 164 and crease damage shield for 6 seconds on the lowest Health ally. 5.Harness Magicka. It creates nearly 1000Coin damage shield for 26 sec. R. Werewolf Transformation. This is a ultimate skill to transform player into a werewolf causing nearby enemies to run n fear and increase Stamina, armor and run speed. Light Attacks cuase bleeding for about 400 physical damage for eight sec. Refreshing Shadows- To increase Stamina regeneration by 30%. Magicka Flood- To increase Max Magicka 8% while a Siphoning ability is slotted. 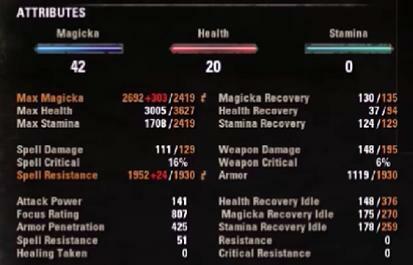 This is also why I use soul tether as my Ultimate on my S/S bar, for the 8% increased magicka. Efficient Purge- to removes up to 2 negative effects from nearby allies and reduces the duration of negative effects on nearby allies by 50% for three sec. Blood Rage- With Werewolf Transform Ultimate slotted, generates 6 ultimate every 3 seconds by taking damage.